When you’re a kid you dream about being a racecar driver. You take your hot wheels cars and zip around the living room. The brightly colored paint schemes and of course the white letters on the tires. The excitement of going fast and beating the competition. What’s not to love? Well you become an adult and look to live out those childhood fantasies you hit a wall. Boom! The price of racing is high! Leave the car out of the equation and it is still expensive. However there is an answer. The 24 Hours of LeMons. For those who don’t know, the 24 Hours of LeMons is an endurance race for “$500” cars. In order to race you find a car that can be purchased at or below $500. 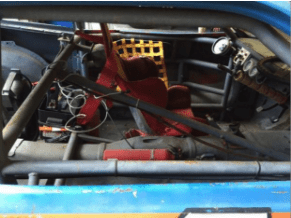 You make it safe by adding roll cage, race seat, harness, etc…… Safety equipment does not count toward the $500 limit. But don’t think you can buy a car for $500 and throw an built LS in it and it pass the sniff test. Penalty laps will be given for blatant cheating. However the quirky relaxed atmosphere does allow for bribes, but again if you show up with something that is over the top you better come with a great bribe. Otherwise you will just be running around the track with no chance of winning, and while that would still be fun, misses the spirit of the event. By the way if you decide to build a LeMons car be careful about what stickers you slap on the side. Examples, performance.ford.com or QA1.net or lingenfelter.com could alert the judges that your pathetic attempt at a bribe is not nearly enough. For more information check out 24hoursoflemons.com . So, how did we discover this fantastic world of “cheap” racing? Excellent question. One evening Lee was watching an episode of Top Gear USA. In this installment the goofy, purposely mismatched trio purchase a crown vic and compete at Sanoma Raceway. After watching the show a fuse was lit. Fortunately Lee and Michael know Geoff Gates of Alloy Motors ( alloymotors.com ). Geoff is well known in the LeMons universe. His team the Pinewood Dirtbags has stood on the winners podium several times (well, if there were a podium they would have been there). Geoff also occasionally serves as a judge/ballbuster for LeMons. 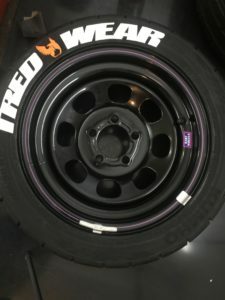 In 2016 Geoff stopped by the TredWear booth at SEMA to see how things were going and a very enthusiastic Lee started talking about the Top Gear episode he’d seen. 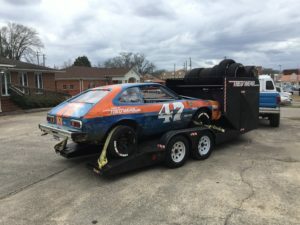 Geoff then informed the guys about his experience and said he would be happy to bring his Chevy LUV out to the Barber’s track and let the guys join the team. The rest of this story can be found in volume one of “The year in Rearview” on our blog page https://tredwear.com/slackers/ . After the race Michael and Lee decided they had to build their own car. A Pinto? What were you guys thinking? 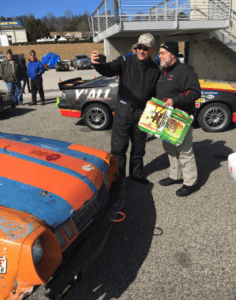 What is the best kind of vehicle for an endurance race? You want a light car. Lightweight unlocks all sorts of doors. It allows the power of the engine to be more effective. The brakes to stop the car quickly. Light and powerful, but don’t forget the endurance part of the equation. You want a drivetrain that is proven. Bullet proof. Ever since competing in the LeMons race, Michael and Lee had been talking non stop about the best car. 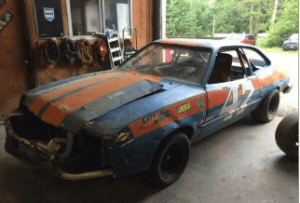 They decided that a former race car could be a great candidate. 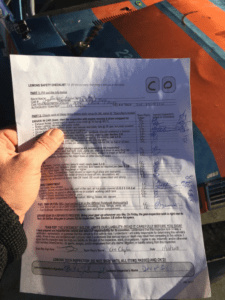 One evening while cruising Craigslist for race cars Lee happened across an ad for 19?? Pinto. 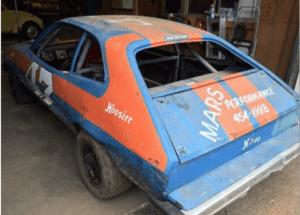 This particular Pinto was a veteran of the mini stock circuit. The pedigree was a bit of a question mark but there were several clues that this car had potential. One, the cage and chassis were built by Left Hander Chassis ( www.lefthanderchassis.com ). Second the 2.3 Lima motor is legendary when it comes to reliability. Just about everyone knows someone who had, or still has a ford ranger with 300,000 miles on it. It appeared that this Pinto had all the elements of the equation. Lightweight, reliable, and strong. Also, because it had spent its life as a race car the car was bound to be punched out to some degree. Sold! You can take the car off the circle track, but you can’t always take the circle track out of the car. Long title but appropriate. The guys made the trek to N. Georgia and purchased the mighty little Pinto. The car really seemed to fit the bill. The roll cage was professionally built and mostly correct. The engine, while a bit of a question mark revved quickly and sounded mean. Also, the natural patina of the car just couldn’t be ignored. However, circle track means left turns, and only left turns. Some areas needed to be addressed. To tackle these areas Lee and Michael took the number 47 to Paul Becker who also campaigns a LeMons car. Paul owns and operates SVP Unlimited ( https://www.svpu.com/ ). Paul and his team primarily focus on Fords and do everything from restoration to parts. After taking one look at the Pinto Paul seemed to fall in love with it. He graciously agreed to bring the old race car back to spec. Since the Pinto build will be covered in more detail later on we will move on. Who is going to drive this thing? Thanks to Paul and his team the car was ready just in time for the race. Now, who is going to drive? Obviously Lee and Michael but at least four drivers are required. While this is a “cheap” car there is actually a lot of $ that goes into it, so you don’t want just anybody behind the wheel. Once we felt pretty confident that the car would be done in time we started putting feelers out for drivers. Our first candidate, Bruce Jensen, was suggested to us by Paul. 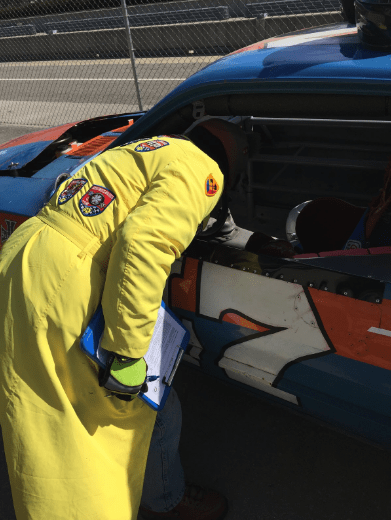 Bruce, is already on a LeMons team, but their car was not ready for race day. The fourth member to join our team was Josh Baggett of Classic Car Motoring. Classiccarmotoring.com specializes in high end collision repair. If you want your ride looking good after a mishap or just freshened up send it to these guys. 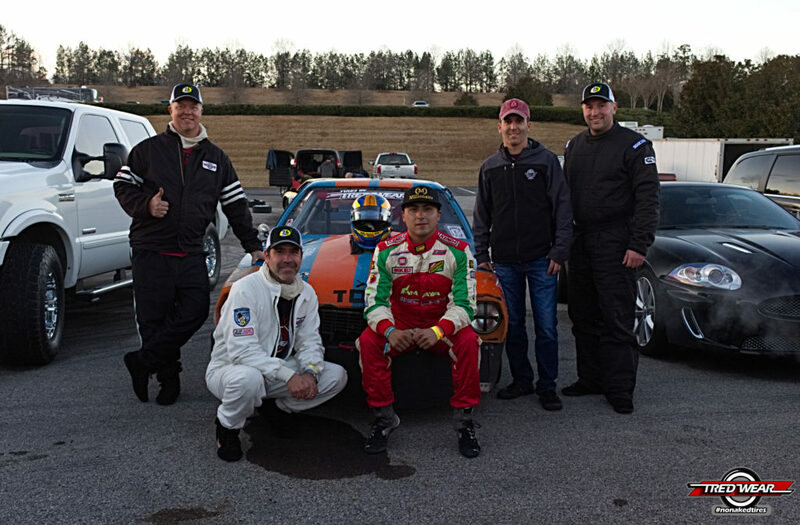 The final member of the team, Carlos Gonzalez, reached out to us the week of the race. Carlos is Formula 3 racer and drives for Panam racing so yeah, we want him on our team. Now this car hasn’t really been driven any meaningful distance in at least 10 years. It would be great to see if it will actually move under its own power down the road. Is that thing street legal? Ummm, NO. Did that stop us? No. Being the scofflaws we are, we took it down the road to see our friends at Ozan speed. The short drive there was too much for the ancient coil. Thankfully the guys at the shop had a spare hanging around. We also discovered a vacuum leak around one of the plates on the carb. Thankfully we have a Bronco with a 2 barrel carb and we grabbed the old egr spacer plate off of it. John at Ozan fabricated a delete plate for the old smog crap, slapped some new gaskets on, and that stopped the leak. After these repairs you didn’t even have to hit the start button. Just turn the power on and flip the ignition and she would fire up. It was like she was just dying to get out and run. Now the car has about 10 miles on it. Not what we would call a true test. However it was the best we could do. So we spent Thursday morning packing everything up. We also slapped some graphics on her. To complete the race car look we went with our own tire graphics kit. We knew from experience our kits would hold up to the punishing conditions of the track. 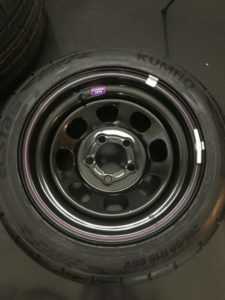 Of course there is no way stickers on a tire could handle this. Only our permanent, made from rubber, white tire letters could survive. Sorry for the blatant use of keywords there. After everything was packed we headed out to the track. Test day at the track. Talk about the unknown. 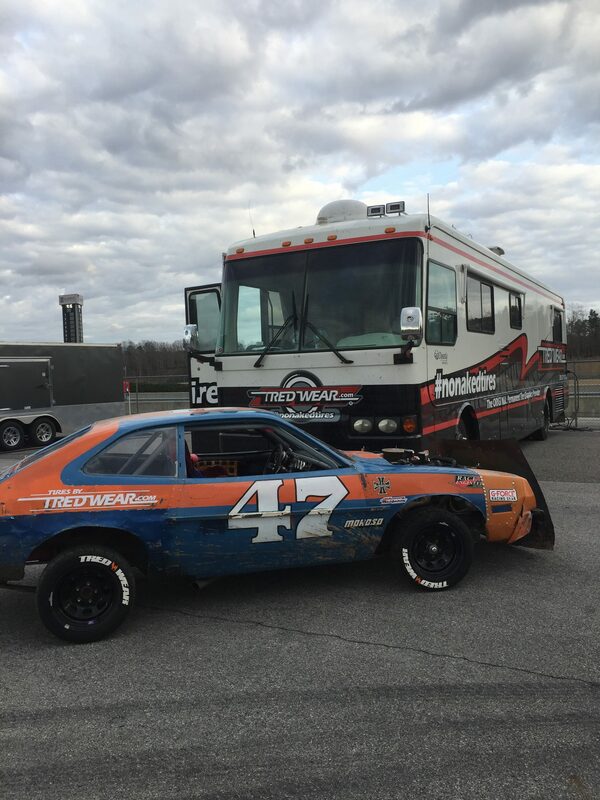 We felt pretty good about choosing the Pinto but this is racing. So many things can go wrong. Will it pass tech? Will it handle? Will the transmission last? Will the engine hold up? Will the engine start? No pressure here. Our initial runs were very good. Michael Hunt took the first run and came back with a very positive review. Next up was Lee Clayton and he too was very surprised at how well the car handled and how strong the engine was. We limited test day to 5 laps for each driver so as to keep our tires fresh and to limit wear and tear to the car. Check back next week to see how team NoNakedTires did in the race.